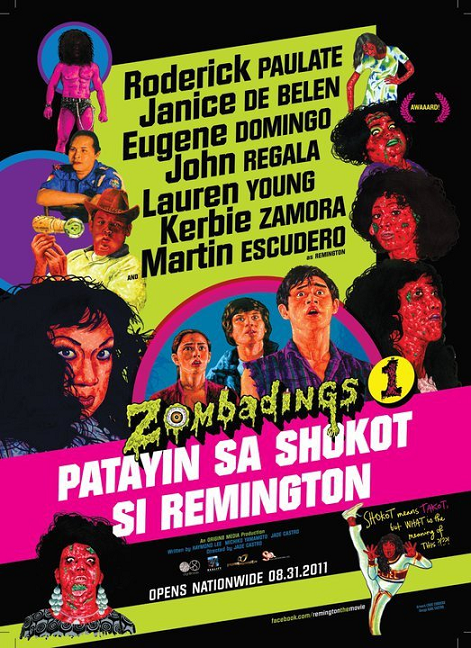 Almost all Filipino blogs has released an article or two about the movie Zombadings 1: Patayin Sa Shokot si Remington (Zombadings 1: Kill Remington By Fear). Let this blog join the happy bandwagon and let me give my two cents on it. Almost all blogs says that it is hilariously funny and smartly written and executed. I totally agree with all of it. I always adore Filipino camp movies. And Zombadings is one classic that is comparable to the level of campiness achieved in the likes of Temptation Island and Secrets of Pura. However, majority of the articles written about the movie is their failure to acknowledge the birth and emergence of a new and unique local pop vernacular different from the recorded dialects in the Philippines which I think was taken into great consideration in the movie. The Bekimon dialect. Awaaard!!! Anyway, this is the only movie where you can find an insane-looking gaydar; a serial killer; a widow in roller blades; homosexual animals; a lunatic policewoman; the morphing of a hunk to an effeminate eve; and of course, gay zombies. All combined and mixed up to create a coherent hilarious movie. All in all Zombadings is undoubtedly heaps of fun. But if those who watched it would contemplate deeper amidst the laughter and entertainment that the movie brought, it is actually a piece about empowerment; it is a deposition on embracing your own personal choice; and at the same time giving a big hard punch towards society’s intolerance and narrow-mindedness. May puso ang istorya at ang hindi matawa sa pelikulang ito, bato.